Just in time for the Note 9 and Galaxy Watch announcement, Samsung will be releasing a new Wireless Charger Duo that can top off both a phone and a smartwatch. The pad/stand combo will be strutting its stuff alongside the Note 9 on August 9, and may have a cheaper version as well. As far as release goes, well, cue the "in Soviet Russia..." jokes here, but the combined charger is already chillaxing in stores in Moscow for the world to see. As you can deduce from the pictures, Duo seems to be a combination of Samsung's wireless chargings pads and stands, as can be expected from the title. This setup allows you to charge a handset both lying down or standing up, and with an adjacent area for your smartwatch, presumably the upcoming Galaxy Watch, and its Gear predecessors, but essentially any Qi-enabled timepiece, too. Insider sources claimed an EUR 75 pricing, which will likely translate into the same tag, but in dollars, come this side of the pond, but the price in Russia is pegged at the equivalent of $112 in local currency, though Moscow is a pretty expensive city, and we wouldn't draw many conclusions for the US price from that Russian tag. 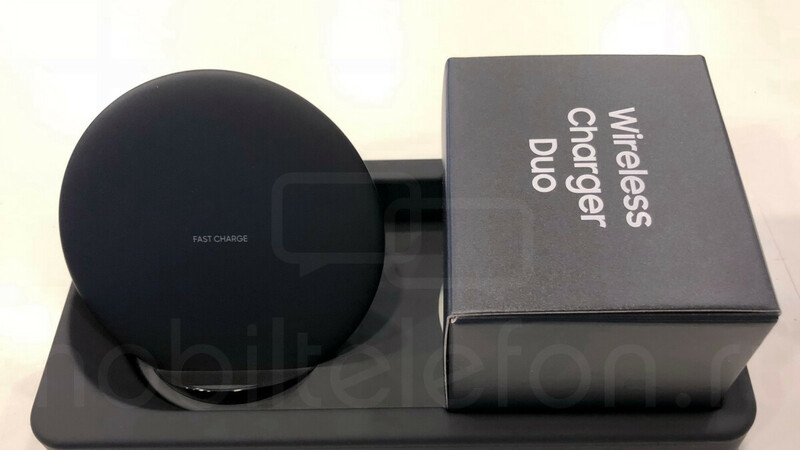 As you can see from the live pictures of the Duo below, it does sport a Galaxy Watch mention and a whopping 25W wall charger that will probably be topping off compatible Qi devices in no time. Where is the apple air right now? That's all it is is two separate pads in the same charger which we have had for a few years now. Will be interesting to see if AirPower ever sees the light of day in the proposed factor shown at their event. Wonder if it'll work with my GS2 Classic? She may be getting old, but she still holds her own. I'd rather have to separate chargers so I can place them in different places or if I wanted them side-by-side I'll just put them side-by-side.